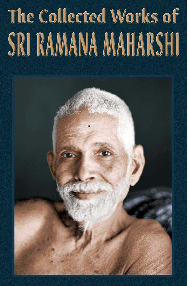 Collected Works of Sri Ramana Maharshi. “Self-enquiry is the first work the Maharshi ever wrote. It was written about 1901, that is, when he was a young man of about twenty-two. He was already a Jnani (Sage) in phttp://www.holybooks.com/talks-sri-ramana-maharshi/erfect realization of the Self, in the resplendent bliss of Divine Knowledge. At that time he was living in Virupaksha Cave on the hill of Arunachala. A number of disciples had already gathered round him. Although he had not actually taken a vow of silence, he seldom spoke, and so wrote his replies to certain questions put to him by Gambhiram Seshayya, one of the earliest devotees. The latter copied them in his diary. After his death this diary was obtained from his brother. The questions and answers were edited by Natanananda and published with Bhagavan’s approval under the name of Vichara Sangraham, or Self-Enquiry. Subsequently they were changed into the form of an essay. The original form has been adopted in the present work. you’ve hit the nail on the head. The issue is an issue that not enough people are speaking intelligently about.